Avery Greenhead Gear life-size series weighted keel green-winged teal duck decoys. There are 4 drakes and 2 hens. These decoys feature Avery's Dura-keels that are permanently attached. Green-wings are fast-flying little ducks that are a challenge to shoot and they make great table fare to boot! Green-wings are common to abundant in all flyways, so you'd be hard-pressed to find a place to put these decoys where they wouldn't look at home. 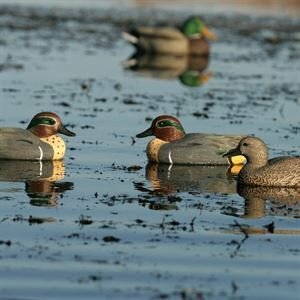 And the really great thing about teal decoys is that their small size makes them a great way to add numbers to your spread without breaking the bank, and these decoys fit well between the larger decoys in your existing decoy bag. So there's always room in your decoy bag to add a few green-wing decoys!